For the home or for the human-skin as a face and body towel. The bulk quantity allows getting a new towel as often as desired daily, for separate face wash and body bathing responsibilities. * Helps with saving on the cost of getting new washcloths as with the bulk quantity they won't be worn down as fast by use/ laundry processes. * If you use a newly laundered face and body washcloth every 2-3 days as recommended, the bulk quantity really relieves the stress of having to do certain laundry loads more than once a week; Which can free up more time to take care of other life necessities/ errands. Machine wash warm, tumble dry low. Like any cotton towels, avoid using fabric softeners or dryer sheets which coat the towel and reduce absorbency. 100% Natural Cotton (will shrink 12-15% overall). We use eco-friendly processing (free of defoliants, dyes and synthetic chemicals) so there may be slight color variations between towels. ❤Premium Quality：100% Cotton Towels sets include 2 washcloths 14*14 inch +2 hand towels 15*31 inch +2 bath towels 31*59 inch before washing! Ideal for bathing and gentle exfoliation. 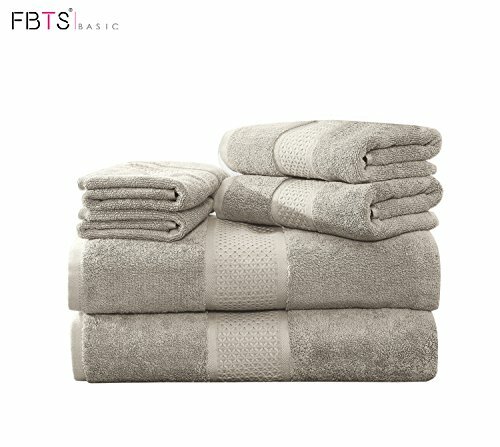 ❤Soft feeling &Thick Texture:Nice soft feel when washing , drying face and 40% thicker than regular towels, making them inherently eco-friendly! ❤Highly Absorbent :The towels are woven to form cozy lines which make it a super absorbent towel. They're soft and plush enough to feel luxurious, but also lightweight and thin to save space when storing. ❤Easy Care without Unraveling：The towels come out of the dryer so soft and supple,which are durable, machine washable, tumble dry on low and can stand up to multiple wash cycles. ❤Guarantee:Our goal is to find you top quality deals, at great discounted low prices, and to provide you with the ultimate best customer service in the world. Shop happy & confident with our 100% money-back guarantee, you deserve it!